L ooking out of the aircraft window while coming in for a landing at Muscat International Airport, one notices the rugged hills of the Al-Hajjar Range that are in stark contrast to the undulating sand dunes that welcome a visitor to the other Gulf countries. As if the hills stand in as Nature’s high-rise structures in Muscat, there seems no need for the gross man-made skyscrapers that mar the skylines of many other cities in the Gulf. 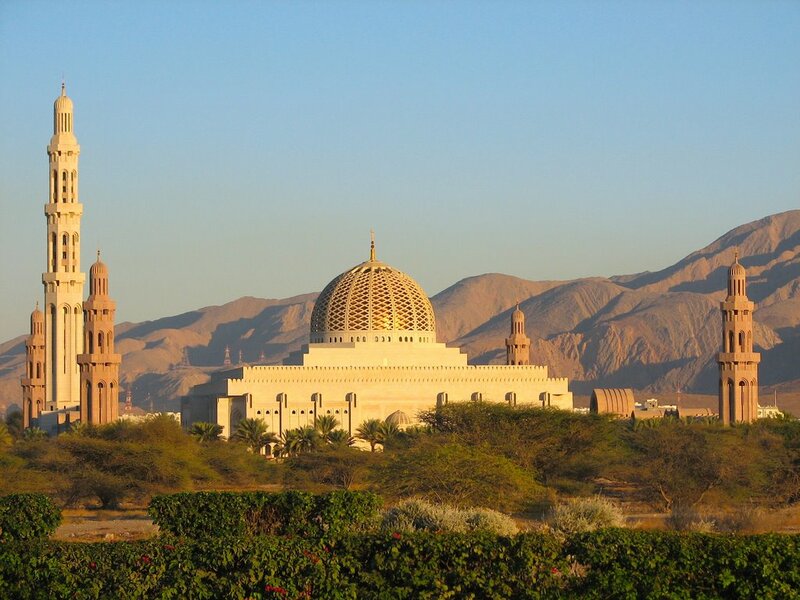 Low-rise buildings in pastel hues and, beautiful mosques with domes in sparkling colours are the features of Muscat architecture. The sooner one alights from the aircraft, the locals appear different too, with their neatly wound, multi-coloured turbans which seem much more utilitarian, compared to the rope-and-tassel affairs in the rest of the Arabian Peninsula. The airport is located at some distance from the city centre but an excellent road adjacent to the coastal hills makes the journey a breeze. The Muscat Gate that marks the entrance at the city limits reminds one of our own Khyber Pass. The roundabouts feature traditional icons like the coffee pots, incense burners, dhows and dolphins. We drove straight to a hotel in the commercial district of Ruwi. The multi-national complexion of the local population is quite evident, like in other Gulf countries. Amongst the expatriates, the Indians dominate in the services sector and convenience stores, while Pakistanis mostly work as labourers and farm workers. Many Baluchis and Gujaratis have settled in Oman and have been granted ‘second class’ citizenship. 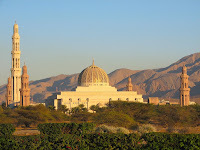 Muscat proper is a small town, with the Sultan’s palace, the grand mosque and al-Jalali and al-Mirani Forts being the prominent landmarks, in addition to several government buildings. The Greater Muscat Area includes the Mutrah district, with its shipping port complex and the corniche. The bleak and barren hills of Al-Hajjar Range, which give a somewhat inhospitable look, dominate most of Muscat. Much of the city’s construction occupies every flat nook and cranny alongside the coast. Crass commercialisation is frowned upon and the symbols of conspicuous consumption are notably absent. This aspect may have to do with the economic downturn as a result of drying up of petroleum reserves, but the government has made a concerted effort to focus on simplicity and traditional values in all walks of life. In Muscat, one finds the Western tourists as well as expatriates respecting traditions by way of their own sensible dress and general conduct, quite in contrast to some other Gulf cities. The arrival of our armed forces delegation was known to the Pakistani community, whose representatives had organised a dinner on the very first evening at a local hotel. At dinner, we were invited yet again to spend the following Friday at the farm of a Pakistani, Haji Abdul Yusuf. Yusuf had moved to Muscat three decades earlier during the oil boom. An enterprising gentleman, he fell in love with Oman and decided to live here forever, if he could. Following up on a government initiative, he purchased some barren land about an hour’s drive from Muscat, where irrigation water had been facilitated by the government. Bringing in labour from his village in Pakistan, he started tilling the land and today, his farm is one of the largest, completely mechanised farms in Oman. A sumptuous lunch featuring a Punjabi fare was the highlight of the visit to Haji sahib’s farm. 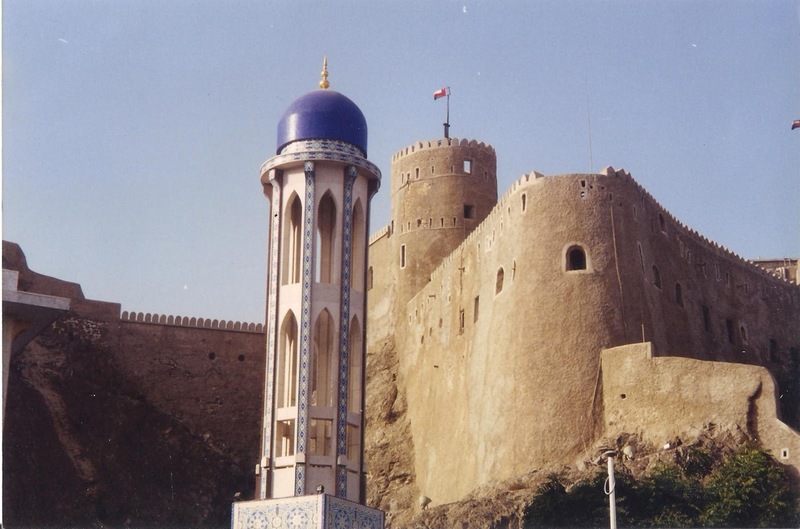 The next day, after the official proceedings were over, we were taken to the Al-Jalali Fort by a motor boat. After disembarking at the quayside, we climbed a series of steps that brought us atop the fort, which afforded an immensely pleasing view of Muscat harbour and the serene waters of the Gulf. 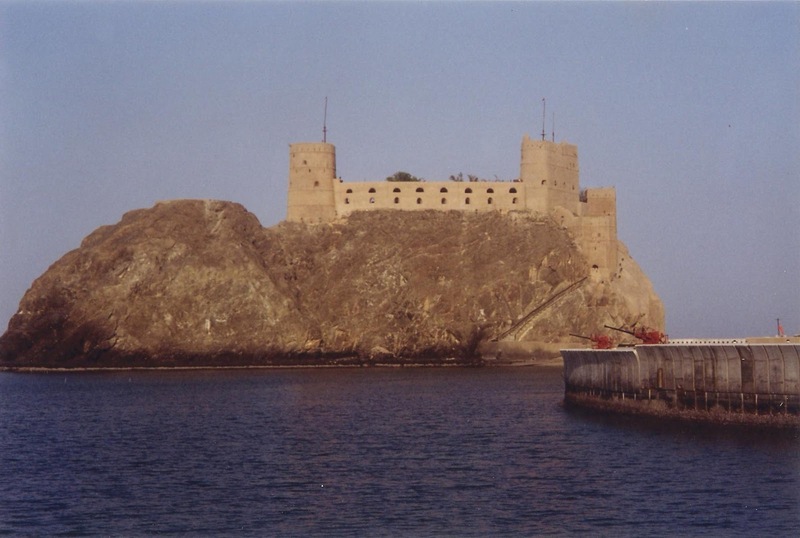 The fort was built by the Portuguese shortly after the sack of Muscat by Afonso de Albuquerque in 1507. Two partially successful attempts were made by the Ottomans to wrest control of Muscat, but it was finally captured by the local Imam of Oman, forcing the Portuguese to finally surrender in 1650. In the fashion of all colonial powers, the Portuguese too committed their share of pillage and atrocities during their rule. The underground dungeons of the fort were evidently witness to the cruelties perpetrated, and we were told that anyone who went in never came out alive. We tested one of the dark dungeons, but mercifully, not only did we emerge unscathed, we found ourselves on a beautiful beach after opening a recently installed door, as if in a dream. The much renovated fort now serves as a cultural showpiece for visiting dignitaries and, we were duly accorded the honour of a sumptuous lunch in the presence of our Omani armed forces counterparts. A visit to the Sultan’s Armed Forces Museum was instructive and one could note the emphasis on preserving Omani traditions, particularly in uniforms and military livery. An evening fete in the Central Armed Forces Officers’ Mess was again an impressive function, where waiters in splendid Omani thobes, complete with badges and other regalia, and well versed in military decorum, served us in traditional style. With the oil drying up, trying to keep up with the Gulf Joneses has been difficult for Oman. All other Gulf capitals have the Corniche, the paved pathways on the waterfronts and Muscat is no exception, having built a beautiful one on the adjoining Mutrah Bay. Similarly, luxury hotels are de rigueur for the rich tourists and Muscat has not been left behind. One of the most impressive that we got to see is the Bostan Palace belonging to the Ritz-Carlton group. 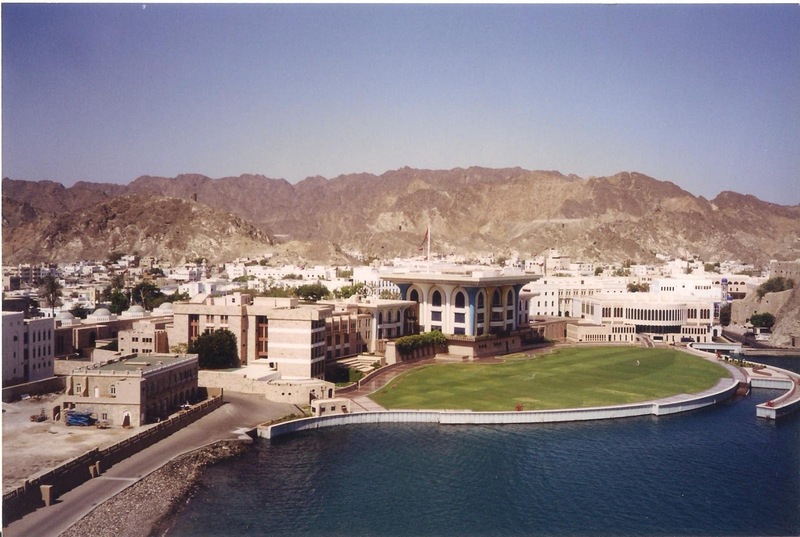 The grand hotel was built in 1985 to house delegates to the GCC summit conference and Oman spared no effort so as not to be singled out as the ‘country cousin’ of the other Gulf countries. The hotel is a place worth visiting and is highly recommended at least for a coffee, if not for a night’s stay that could leave you lesser by 1,000 Omani Riyals! Of all my travels in the Gulf cities, I liked Muscat the most, in part for its well-preserved past and, for the fact that its architecture blends with the natural surroundings without being an eyesore. Beautiful mosques, open air souks, traditional dhows bobbing in the placid harbour, flower-laden gardens and palm groves, and turbaned men with daggers in their belts, all conjure up images from One Thousand and One Nights. If one were to look for the jewel of the Arabian tropics, one need not go farther than Muscat. This article was published in the daily newspaper The News International on 17 February, 2013.